Multiple cold plates are integrated into a single system to provide high heat fluxes from at several key cooling points. This application is designed to cool a phased-array antenna with a fairly high heat load. A multiple cold plate, direct refrigerant cooled system was developed for a customer requiring exposure to high ambient temperatures and outdoor exposure. 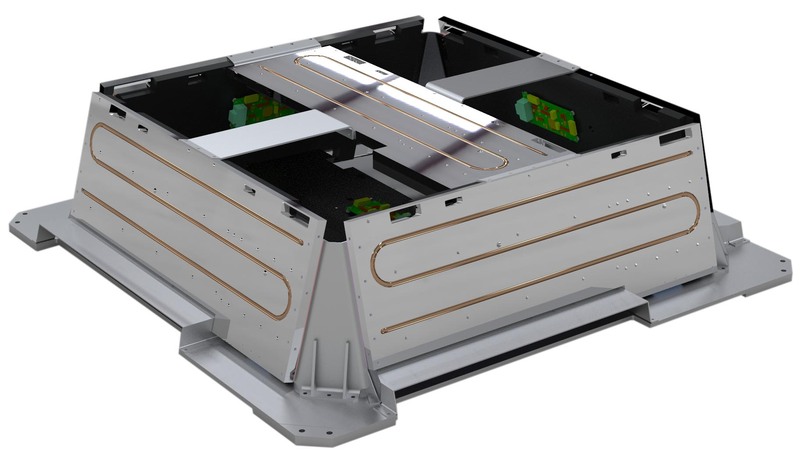 Six cold plates dissipating a total of over 600 watts of waste heat were designed to interface directly with the customer’s heat source (a phased-array antenna). The system was designed to fit a highly constrained space and support varying heat loads on each cold plate. Developed as a prototype, this system has successfully undergone significant field testing.